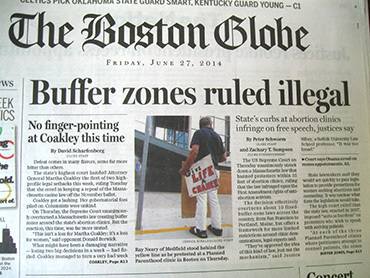 Below the headline on Page 1 of the June 27, 2014 Boston Globe, the day after the U.S. Supreme Court's announcement of their 9–0 vote upholding the right of Pro- life supporters in McCullen v Coakley, the caption read, "No finger-pointing at Coakley this time." The Globe spinmeisters have never been more transparent in word manipulation than their display after this unanimous SCOTUS decision. The 9–0 McCullen victory actually turned upside down all they had voiced for over 7 years about the 35-foot buffer zone law. Yet, the article went on to cite a political science professor at a local Roman Catholic college calling it, "a net positive for Coakley." Martha Walz, the Chief Executive of the Planned Parenthood Federation of Massachusetts, who previously was one of the authors of the overturned "buffer zone" bill as a State Representative, was effusive in her praise for Attorney General Coakley. "Martha Coakley has been a tremendous champion for women's access to health care. She's been a tremendous champion for the buffer zone law." Walz, the Globe stated, ' also heads Planned Parenthood's political arm, which endorsed Coakley for Governor last month." As if the Globe did not want to ignore the third main cog in Boston's Axis of Evil, the article went on to quote a couple of Harvard law professors. "It was a bad law," said professor Mark Tushnet. "It would be astonishing if any lawyer won the case." That statement was a real eye-opener to anyone who had read all the Globe had written for 7 years in favor of this "35-foot buffer zone" law. . Professor Tushnet also was quoted as saying the justices found the law "impinged on the rights of everyone outside the clinics, whatever their views." Everyone? Has he read anything about those Planned Parenthood clients who made life-threats while standing within the zone at pro-life counselors who were outside the 35-foot yellow line? Perpetrators were able then to find a safe haven inside the abortion clinics, unless the police were willing to enter the premises and apprehend the individual. Obviously, the Harvard professor did not do his homework. 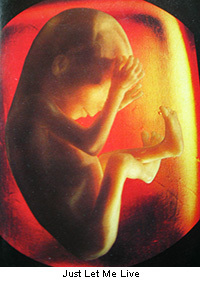 In continuing to demonstrate their visceral dedication to the denial of the rights of pre-born humans, the Globe article quoted another of the Harvard Law faculty, Nancy Gertner, who stated that losing two unanimous Court decisions, "did not produce a 'bad week for Coakley' narrative." The Globe added that Gertner stated that the pro-choice position has "been enshrined in the law for years." Reflecting on the spin now being applied to the McCullen v Coakley story, readers had to wonder how the narrative would be worded if they turned to the sports pages and found the Red Sox had been shutout 9 to 0, not an improbable occurrence in the 2014.season. Would the Globe have stated that in reality the result was a victory? John Henry, principal owner of the Boston Red Sox, who in 2013 added the Globe to his business portfolio, probably would have found it to his liking, given the team's current won-lost record The New York Times took a financial bath of over a billion dollars, selling the publication to Henry, although he was admittedly the fourth highest bidder. Henry promised to continue the Globe's "vibrant journalism." While the "Athens of America" boasts of having such a heavy concentration of institutions of "higher learning," performing verbal gymnastics in an attempt at enshrining the right to destroy a developing unique member of our human family in utero, equates with barbarism, rather than an enlightened civilization. Harvard-educated, Chicago-native Governor Deval Patrick quickly called a press conference after the 9 to 0 McCullen decision. Pictured with AG Martha Coakley, PP CEO Waltz and other pro-abortion luminaries, they announced their intent to pass into law a new bill to protect "public safety." Accompanying the shrill tone at the event was the release in the media of decades-old stories of violence. The most common one is of the 1994 killings by deranged hairdresser John Salvi, who had no connection whatsoever with any Right to Life organization. Salvi's past is always carefully tailored, including avoiding his sexual orientation, and any of the the facts surrounding his death in prison..
Conveniently absent from media stories – or completely downplayed – was the fact that there has never been a conviction, or even a prosecution, of an opponent of the abortions performed inside these abortion clinics. They media are totally silent about the fact that all the violence and life threats have been perpetrated by people connected with the clinics – against the pro-lifers who were standing outside the "buffer zone." Court records of these attacks ON PRO-LIFERS are ignored by Associated Press, Reuters and all other major news outlets, while fully aware of them. They choose instead not to upset the Globe narrative. While this ramming through of a new version of the struck-down law was taking place on Beacon Hill, the Commonwealth's two U.S. Senators were fighting the "War On Women" in Washington. They were voting to nullify the 5 to 4 SCOTUS decision upholding Hobby Lobby's religious liberty not to provide employees with abortifacients. Sen. Edward Markey, a quintessential home-grown political type, was a co- sponsor of the bill which fell short of the necessary number of votes. Newcomer, former Harvard Law professor Elizabeth Warren, could be viewed in her usual panic mode, lamenting the effect of the loss on women's "reproductive health." Freshman Warren, whom the university proclaims received no preference because of her alleged 1/32nd Cherokee bloodlines, was pre-occupied with pushing her far-left agenda. 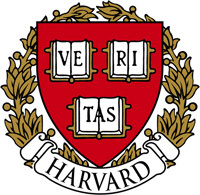 The lie can put to the denial of her using this nebulous heritage by the Harvard Law School's directory having listed the hazel-eyed blonde as American Indian. As with President Barack Obama's personal issues while Editor of the Harvard Law Review, a stone wall has been erected. Transparency has a different meaning behind their ivy- covered walls. Although claiming to have much empathy with issues of the middle class, this multi-millionairess resides in a million-and-a-half dollar mansion in Cambridge. Six months prior to her being elected to a six-year term as a U,S. Senator from the Bay State, 4 out of 5 residents could not even identify who the native Oklahoman was. While also professing great empathy to the hundreds of thousands of Central American children lured by the Democrat party to trek through Mexico and cross into the U.S., there is no evidence of her intent to house any of them in her spacious residence. As with Gov.Deval Patrick, who owns a 77-acre estate in Massachusetts, her own lifestyle reflects the ruling class's sheer hypocrisy. Observing Warren's demeanor is a sight to behold. Addressing a crowd of fawning supporters, her head bobs, and she chops and gesticulates with hand movements resembling an orchestra conductor. Throughout she seems to be gasping, rather than articulating anything. Fresh from her being catapulted to the U. S. Senate, her leftist views have now led to a media-generated attempt to cast her as Presidential timber. Inquiries as to Senator Warren's views on the McCullen and Hobby Lobby Supreme Court decisions brings one into another "buffer zone." Washington-office aides are unable to answer any specifics relative to her stance on any current bill or on which she may be casting a vote. Constituents' questions are answered by stating " the Senator backs anything which supports women." Follow-up questions get a repeat of the same mantra, leading one eventually to abandon any hope of coherent dialogue., let alone impassive argumentation. Chief Justice John Roberts once-again displayed his political side in winning over the left-wing element and gaining a unanimous vote in favor of McCullen et al. The Left, knowing that they had lost with the Kennedy swing vote in favor, wanted to leave a door open. That entrance was Robert's upside-down statement that the "buffer zone" law was content-neutral, a completely false assertion. This was clearly a gift to former Harvard Law School's Dean, Justice Elena Kagan. Beacon Hill, the Globe Editorial offices, and Planned Parenthood at 1055 Commonwealth Ave in Boston, started on a revised law immediately, sensing a new opening. The Golden Dome at the State House was sadly once-again being tarnished . Any examination of the 7-year history of the overturned "buffer zone"law clearly revealed that there never had been a prosecution of a single pro-life counselor or abortion protester. Rather, the opposite was the case, as those in favor of the right to life were the victims of the violence and life threats – by workers, clients and escorts under the aegis of Planned Parenthood. The clarification of who were the perpetrators and who were the victims was affirmed by Asst. AG Jennifer Miller who argued the Coakley side of the state's case on Jan 15, 2014 before the entire 9 justices. The "pro-choicers" were clearly the perpetrators in her arguments to the Supreme Court. Court records provide the proof of the fact. that Martha Coakley and Martha "Marty" Walz's constant repetition of "threats," "intimidation" and "violence" by opponents of abortion these 7 years are totally unsupportable – and the bold-face lying is transparent. Court records notwithstanding, their narrative would prevail, and the 9–0 McCullen decision would soon be nullified. by them with their political power..
Justice Antonin Scalia stated that in the McCullen decision "Roberts had given abortion rights advocates a pass." 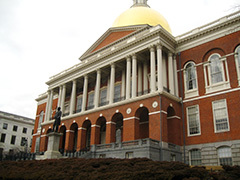 Seemingly proving this, as the Massachusetts legislative session drew to a close, a 1-day public hearing was held and with hardly a pause, the Senate passed the new "buffer zone" bill by unanimous voice vote. Within days the House passed it with 119 yeas, 3 nays and 3 abstentions. PP's Marty Walz was delighted. "There's clear recognition of the public safety concerns by the staff and patients at women's' reproductive health care centers," she said. With proponents saying that the new bill fits within the legal standards prescribed by the McCullen decision, law enforcement officials can disburse 2 or more individuals, if it is felt they are impeding access to the facility. The disbursed group would then be required to stay 25 feet from the entrance for 8 hours or until the clinic closes. It now takes only 2 to constitute a gathering and the police are judge and jury. Concurrently – and very much in the news – was the issue of whether the state should be housing some of the Central American children who had illegally crossed the U.S. southern border. Governor Patrick chose to keep both major issues in the forefront to gain the maximum PR, as he builds his resume for future use politically. The major surprise was the religious posture he now assumed, never seen before in his public persona. The media, as anyone should expect, accommodated him without question. The bible now became the moral foundation for his positions. This man from South Chicago, having received a privileged free ride through prestigious Milton Academy and on to Harvard now feigned great feeling for the illegals. While providing theatre, it just didn't fit with any veteran of the local scene. It was melodrama – at its worst. .
"Eyes filling with tears as he quoted scripture, " the Globe said Patrick defended his plan to provide temporary shelter for up to 1000 children who have crossed the U.S. – Mexico border illegally ..." The article continued, "I believe some day we will have to answer for our action – and our inactions, Patrick said, choking up as he was flanked by religious leaders, including Cardinal Sean O'Malley." Obviously, the tragedy here is the transparency of the analogy which vividly applies to the 25,000 unborn children not allowed to enter our Commonwealth by being aborted every year. Yet, the governor was at the same time preparing for the signing into law of the bill to protect "Reproductive Health Care Facilities," which terminates their existence. Doubly tragic is that there is no evidence the Cardinal or any other religious leader pointed out this stark reality. They seemed more interested in the photo op. In his sermonizing, the governor was reported by the Globe as supplementing his words of Christ from the Gospel of Mathew with quotes from Leviticus, an Old Testament book not in much favor with today's so-called Progressives. Patrick stated that "if a stranger dwells with you in your land, you should not mistreat him." Are we to believe that the Roman Catholic Cardinal and other religious leaders could not hear what was being said if you substituted the word "womb" for "land" in this quote? This photo was widely distributed, as was the one several days later on July 30, when Massachusetts Gov. Deval Patrick, at one time a Director of Planned Parenthood, was surrounded with a bevy of abortion supporters in the official signing into law what amounts to a Buffer Zone II. Labeled "An Act To Promote Public Safety And Protect Access To Reproductive Health Care" it actually improves the ability of the abortionists to continue destroying members of our human family. It will cost taxpayers still more money, especially in Boston, Worcester and Springfield for extra police duty never before required – and all of its rationale is based on a distortion of reality, in addition to some outright lies. This mis-named Act will allow the de-parenting to continue unabated in abortuaries, which are certainly not true "health care" facilities. The law serves to firm up a nearly one-billion dollar virtually unregulated industry, whose profits are derived from the blood of innocents. On the day of the signing PP CEO Marty Walz was sending a fund-raising appeal, supporting AG Martha Coakley's campaign to be Deval Patrick's successor. In directly referencing the McCullen decision, Walz stated, "Immediate real consequences were felt: Patients cancelled their appointments (appointments for lifesaving cancer screening and birth control) and dashed into traffic to get away from protesters." This is her exact quote! To think that anyone would believe this spin boggles one's mind. Creating a completely false picture of a truly bloody business operation to get legislation railroaded through a docile, servile legislature and signed into law constitutes a shameful indictment of the current political structure. For it to have reached this level, however, should cause us to engage in the deepest form of reflection on what we are seeing happen. 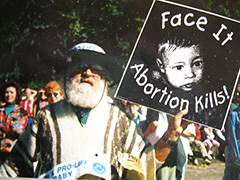 The Boston Globe on the day of the signing reported that "The reversal legislation improves upon the annulled buffer zone law ..." Never once did they mention that there was never a prosecution or conviction of a peaceful protester of abortion during its 7-year life. 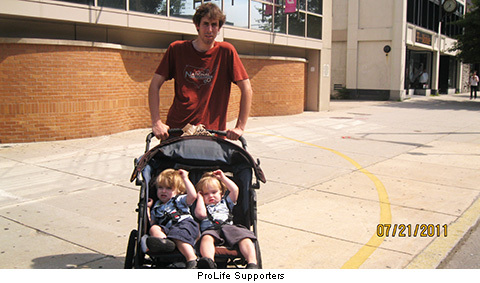 Worse still, however, is the fact that they totally ignored the verbal and physical attacks on pro-lifers, including the legal action on the death threat in 2009 where Planned Parenthood provided a safe haven for the perpetrator until the Boston police flushed him out of 1055 Commonwealth Avenue. It's all public record. A serious illness plagues the present political environment in Massachusetts and its effects extend across the entire nation.. The abortionists and their political allies are reaching the highest levels of outright deception by painting an unreal depiction of the money-making activity in which they are involved. Eleanor McCullen's activity in defense of human life will not change a whit – nor will the other stalwart sidewalk counselors around this once-respected Commonwealth The protagonists in this drama who are now claiming victory, however, are well aware that the prize they believe they have snared is soaked in the blood of innocents. George Orwell surely said it best about the words we heard from all of their lot, "Political language is designed to make lies sound truthful and murder respectable – and to give an appearance of solidity to pure wind"..